Lows tonight won’t be as cold as previously forecasted as we still have plenty of clouds around to keep us cool, but not cold. After a chilly start tomorrow we’ll break out into mostly sunny skies with highs in the mid 50s. It’s Sunday through Tuesday we have to keep our eyes on and calendars open for. Even though we are now running the risk of more in the way of mid to high level clouds above us on Sunday, it still looks warm with highs bouncing into the low to mid 60s. Lows will be in the 30s to lower 40s. Mid to maybe even upper 60s are in the forecast for Monday as it looks to be the warmest day of the week. Skies will be mostly sunny. Low to mid 60s are in the forecast for Tuesday before a gradual break down of the ridge arrives and almost literally rains on our parade. 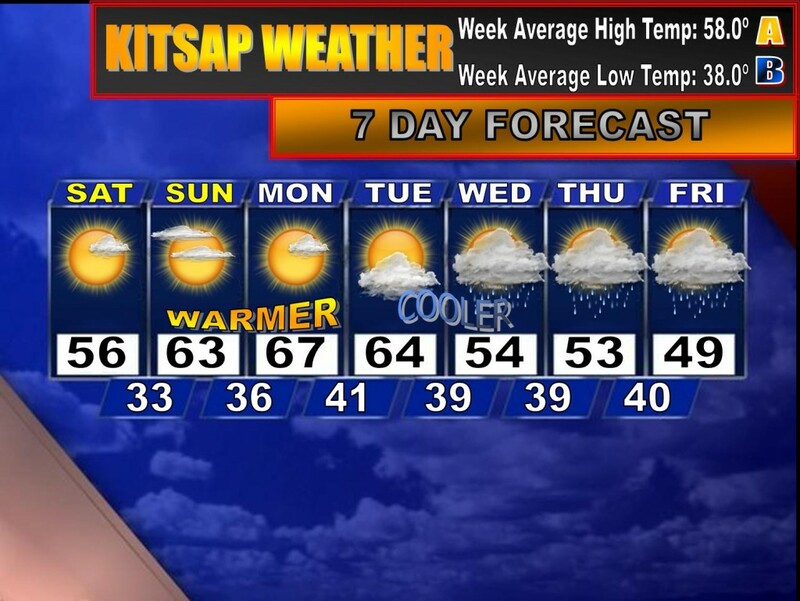 Clouds, rain and cooler temperatures dominate the latter half of next week into next weekend. Have a great evening. I’ve been quite busy today so I’ll do my “Long Range Thoughts” post tomorrow. *Notice this is the first time since I started this blog that I’ve used the block letter ‘A’ next to the “Weekly Average High Temperature” which signifies a week of above normal temperatures! According to that map bothell could reach 70? Even at 60 its too balmy for me in fact i use a fan in the winter too! Yes I expect the PSL to reach potentially the low to mid 70s with this pattern. Those high temperatures look quite favorable. I’m the same way about warmth, don’t worry 🙂 I can actually handle the 60s/70s but anything beyond that is much too warm!